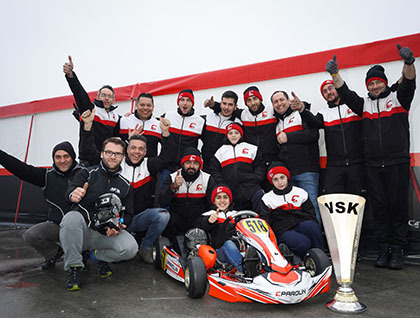 In the first event of the WSK Super Master Series, the Adria track remained wet and slippery until the Prefinals. In these winter conditions, the Parolin chassis once again demonstrated their versatility on all terrain, allowing many drivers to express their talent. The superb victory for Rashid Al Dhaheri in Mini, and the performances of Brando Badoer in Junior and Gabriele Mini’ in OK, brought great satisfaction to the Parolin Racing Team. 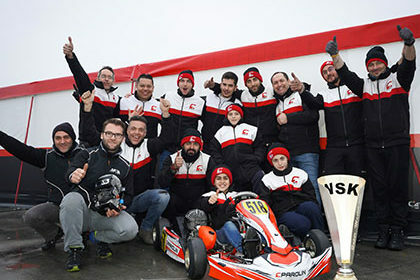 “While most of the season’s competitors were there for the opening of the WSK Super Master Series, the Parolin brand has remained the best represented on the grid, not only in Mini, but also in Junior, and our project is also progressing in the top category,” said Marco Parolin. “Our successes in Mini confirm this as much as our breakthrough in OK-Junior and our level of performance in OK. However the weekend at Adria was very wet with consequent numerous incidents and penalties. The victory for Rashid Al Dhaheri in Mini is all the more beautiful as he started from a long way back. The 100% Parolin 60 Mini podium obviously gives us great satisfaction“. It was the young Maxens Verbrugge who set the fastest time of the official Parolin team in 60 Mini, but incidents and a penalty in the Prefinal caused him to miss his qualification. Meanwhile, Rashid Al Dhaheri was back in 5th position with three wins, a feat after starting from 33rd place in Qualifying. Strong and determined, he fought in the leading group for the Final victory and managed to win after a crazy race, thus taking the lead in the championship. With great determination, Douwe Dedecker managed to recover from 60th place in Qualifying and reached the top 20 of the Final. The other drivers of the team suffered in the pack as a result of poor performance in Qualifying in the rain. They all made good progress in the heats, for example Keanu Al Azhari regained 31 places in five heats, but their starting handicap was too great to allow them to reach the Final. 4th in Qualifying, Brando Badoer represented the best chances of the Parolin Racing Team in OK-Junior. Winner for the first time of a heat in his new category, he was delayed by a retirement, but remained in the game by finishing in the top five of Prefinal B. The Final did not go as well as expected in the dry, and Brando first lost ground before taking back positions at the end of the race to finish 19th. Alessandro Cenedese, Martinius Stenshorme and Vinicius Tessaro also had to give up in the fight of one of their heats. Cenedese was penalised in the Prefinal before finishing 26th in a complicated Final. Tessaro made up for a very good Final B where he finished in 2nd position while Jesse Carrasquero continued his progress in the pack. Although rain is not his favourite conditions, Gabriele Mini’ did not leave the front of the OK category. 5th in Qualifying, he won one of his heats before taking 3rd place in his Prefinal while posting the fastest lap in the race. Gabriele fought for a long time between 3rd and 5th position in the Final and planned to ensure a good result at the finish, but a broken chain decided otherwise two laps from the goal. The next meeting for the Parolin Racing Team will be at the end of February at Lonato for the second round of the WSK Super Master Series.